(2017/Ace) 22 tracks in mono. Ultra-chic yé-yé from the cult movie star. Booklet features a new exclusive interview with the artist. Ultra-chic yé-yé from the cult movie star. Booklet features a new exclusive interview with the artist. 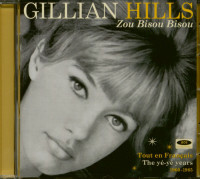 In the early 1960s Gillian Hills was at the heart of a cultural shift that saw French popular music evolve from the chanson tradition to embrace modern pop and rock influences. Indeed, she may well have acted as a catalyst for that change, incorporating both American and British influences in her recordings when she could. And yet, by the time Gillian was 21, her recording career was all but over and she would return to acting. That she was able to embrace all the emerging opportunities in the era of “the teenager” ensured she was a popular presence on television, radio and in magazines – in France at least. Discovered by film director Roger Vadim, Cairo-born Gillian is best known for her roles in cult movies such as Beat Girl (1959), Blow-Up (1966) and A Clockwork Orange (1971). Her parallel career as a teen singer-songwriter saw her record for the Paris-based Barclay label and, buoyed by her appearance in 1962’s Les Parisiennes and touring alongside Johnny Hallyday, Gillian became popular on the burgeoning yé-yé scene. Working with maestros Paul Mauriat, Jean Bouchéty and Mickey Baker, Gillian’s recordings benefitted from superb arrangements and top-notch orchestration. Encompassing sentimental ballads, beaty numbers plus Gillian’s own compositions, this 22-track best-of comprises original material and cover versions. Having worked latterly as an illustrator, the spotlight was once again thrown upon Gillian when 'Zou Bisou Bisou' featured in Season 5 of ‘MadMen’ in 2012. This spawned a cover version by actress Jessica Paré and also saw Gillian’s recording played out in the coveted closing credits spot. Since then her rendition has been used as the soundbed for an international L’Oréal shampoo campaign. Highly regarded by yé-yé aficionados, Gillian Hills is a welcome addition to Ace’s French pop compendium. Customer evaluation for "Zou Bisou Bisou - The Ye-Ye Years 1960-1965 (CD)"